Situated between the villages of Belsay and Bolam, not far off the main road to Newcastle, is the hamlet of Harnham. The little settlement was once home to the famous Babington family who resided in Harnham Hall – little more than a glorified farmhouse, which still exists to this day. In the mid-1600s, it was the home of Katherine Babington, daughter of Sir Arthur Hesilrige, the great Parliamentarian, and the wife of Major Babington, Governor of Berwick. Katherine was regarded as something of a beauty, but with this came a stormy temperament – making her something of a celebrity in her day. People would go out of their way to catch a glimpse of this petulant character, such was her ability to attract the wrong sort of attention (she was once reputedly banned by the authorities from ‘eating pies in public’!). Most infamously, this most notorious of nonconformists cocked a snook at the local clergy by bribing a butcher-boy to drag the local parson from his pulpit. Later she was prosecuted for contempt, and even imprisoned in her own home by her husband to keep her from causing chaos. Amidst all of this she was, of course, excommunicated – so when, in 1670, she died, the vicar refused to allow her to be buried in the parish churchyard. Her well-to-do widower soon came up with an answer, though. In a move with which the stroppy Madam Babington would most surely have approved, he buried her in the back garden – in a cave hewn out of a rocky outcrop. Years later, the tomb was robbed and her remains scattered. And some will look on thee. 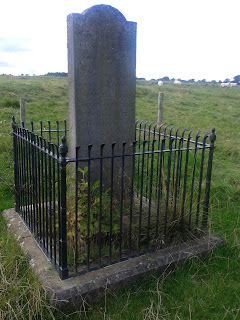 In the shadow of Kirkharle’s small but rather famous church of St.Wilfrid’s (baptism of Lancelot ‘Capability’ Brown, et al) sits a curious monument dedicated to the memory of one Robert Loraine. This prominent local landowner and dignitary lived in the troubled days of the Border Reivers, and was known as ‘a zealous Prosecutor of Robbers, Thieves & Moss-Troopers’. He lived in Kirkharle Tower, and maintained a number of alliances with other families (notably the Fenwicks) as well as a large stock of arms and horses to help maintain law and order as best he could. On day in 1483, however, Robert Loraine let his defences slip and was killed by a party of Scots who ‘lay in ambush between his house and the church… & in his return home, suddenly surprised and dragged him into an adjacent Close’. The attackers, determined to make an example of Loraine, cut his corpse up into tiny pieces, stuffed them into his horse’s saddlebags and set it loose to wander home. The monument we see today to the chap known locally as ‘the unfortunate gentleman’ was erected in 1728 by a descendant, Sir William Loraine (the first employer of Capability Brown, actually), and replaced an earlier stone which had fallen into disrepair. Sitting by the roadside in the grounds of the stately home from which they take their name lie one of the region’s most unusual little landmarks: the Wallington Dragons. In a site filled with interest, both inside the hall and without, the dismembered heads are perhaps the biggest oddity of them all. They sit by the B6342 at the end of a long lawn which rides up to the east face of the hall, but are invariably missed by those unaware of their presence; which is a shame, as they are a delightful ‘find’ for youngsters, whilst leaving us adults flummoxed. Though they seem utterly out-of-place, their presence is actually very easily explained. Among Wallington Hall’s many esteemed owners was the Blackett family (late 17th – late 18th centuries), during which time Sir Walter Blackett (there were a few of these, but this was the one who lived 1707-77) substantially restructured the hall. The Blacketts were big players in the coal trade and it is said that the stone heads were brought north from London in 1760 as ballast in one of Sir Walter’s coal ships. Sources vary slightly as to their exact place of origin, with Bishopsgate or nearby Aldersgate being the likeliest spots, and they probably date to the 16th century. Quite what the dragon heads’ original purpose was down in London we can only guess. 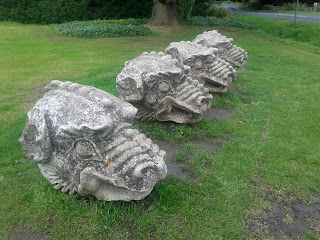 They look suspiciously like gargoyles, of course, but who knows? However, as dragons adorn the City of London’s coat of arms it is, perhaps, no surprise that oddments of this type were to be found lying around the streets when ballast was being sought out in days of old. Anyway, after their journey north to Wallington a use was eventually found for them. More than a century after their arrival, the slightly oriental-looking affairs were dug out of storage and placed in their present location in 1928, and are now Grade II* Listed. The Northumberland flag is based on an ancient design, the origin of which is buried deep in the Dark Ages – making it, most probably, the oldest flag design in Britain. … There is a noble monastery in the province of Lindsey, called Beardeneu, which that queen [Osthrida, queen of the Mercians] and her husband Ethelred much loved, and conferred upon it many honours and ornaments. It was here that she was desirous to lay the venerable bones of her uncle. When the wagon in which those bones were carried arrived towards evening at the aforesaid monastery, they that were in it refused to admit them, because, though they knew him to be a holy man, yet, as he was originally of another province, and had reigned over them as a foreign king, they retained their ancient aversion to him, even after death. Thus it came to pass that the relics were left in the open air all that night, with only a large tent spread over them; but the appearance of a heavenly miracle showed with how much reverence they ought to be received by all the faithful; for during that whole night, a pillar of light, reaching from the wagon up to heaven, was seen by almost all the inhabitants of the province of Lindsey. Hereupon, in the morning, the brethren who had refused it the day before, began themselves earnestly to pray that those holy relics, so beloved by God, might be deposited among them. Accordingly, the bones, being washed, were put into a shrine which they had made for that purpose, and placed in the church, with due honour; and that there might be a perpetual memorial of the royal person of this holy man, they hung up over the monument his banner made of gold and purple; and poured out the water in which they had washed the bones, in a corner of the sacred place. From that time, the very earth which received that holy water, had the virtue of expelling devils from the bodies of persons possessed. Moreover, Wilfrid and other prominent Northumbrian clerics were known to have worn vestments of gold and purple. In medieval times, the colours and the flag were adopted by the Earl of Northumberland. The flag is now officially registered as shown above, with eight alternate stripes of red and gold; and by official decrees in 1951 and 1995 was properly adopted by Northumberland County Council as their emblem. Anyone in the county can fly it – but make sure you get it the right way up, with the gold panel at the top nearest the flagpole! 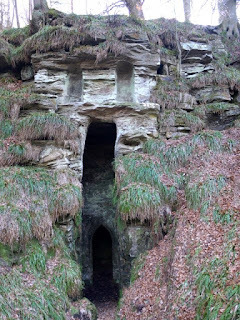 Carved out of the sandstone cliff overlooking the Hart Burn, a little upstream from the village of the same name, can be found a curious manmade cavern – created, rather daftly, for use as a changing room for those mad enough to want to bathe in the nearby river. It is known as Hartburn Grotto. Dr John Sharp was vicar of Hartburn for forty-odd years from 1749, and it was he, with the help of his parishioners (who must have laboured with some puzzlement), who built the said structure in around 1760. It has a high, slit-like entrance, with two niches for statues above; and an internal gothic arch, which separates the inner and outer chambers – one of which contains a fireplace. The said niches used to hold statues of Adam and Eve. And, best of all, there is a 15m-long underground tunnel from the grotto down to the river, allowing bathers discrete access to the watery facilities. Many believe that the monument’s likeness to a rough-cut chapel may hint at an earlier manmade origin for this strange fold in the landscape – almost certainly expanding upon what would have originally been a natural cave or cleft in the cliff face. Its closeness to the Devil’s Causeway could well mean that a Roman temple may have occupied the site – and if not, then there may well be some other distant spiritual connection to an earlier age. Coincidentally, the grotto lies a few yards away from the site of a former Roman river crossing of the Hart Burn, where the aforementioned Devil’s Causeway spanned the wooded valley. Faint traces of Roman engineering can still be found in the river, rocks and landscape thereabouts.